Unofficially named Glacier Divide Peak lies in the middle of the Glacier Divide, a 10mi-long ridgeline forking west from the Sierra crest, separating Evolution Valley to the south from Piute Canyon and Humphreys Basin to the north. It forms the northern boundary of SEKI NP and has nine significant summits along its length, three of which had previously featured in the Sierra Challenge. 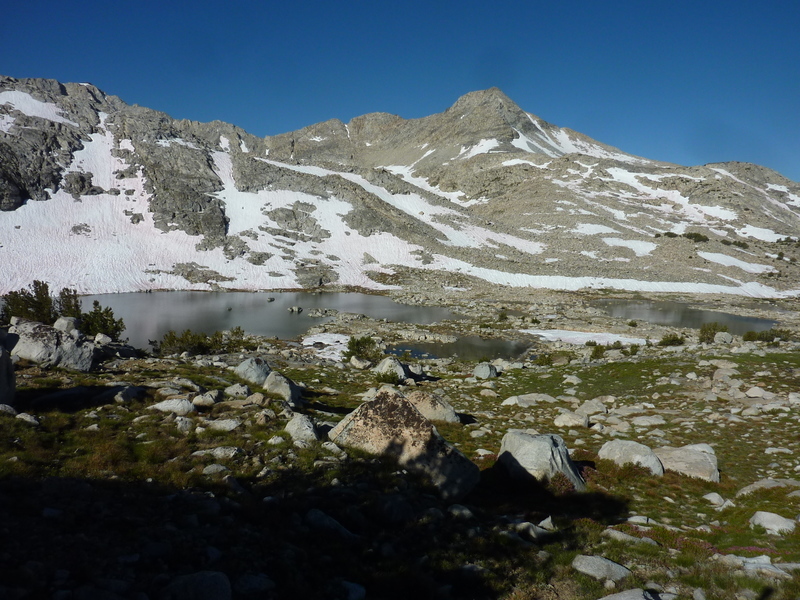 The shortest approach is via Piute Pass, a relatively easy hike from North Lake where we started the day. Come Monday, it's usual that we lose our weekend participants, and we found ourselves with a much cozier group of just seven at the TH. Jim P planned to visit Goethe while Mason and Kristine were heading to Humpheys, leaving just four of us for the day's Challenge peak. We spent the first two hours hiking the trail to the pass, finding a large snowfield on the east side of the pass just before we reached it. I had crampons and axe once again (and would find opportunity to use them later) but did not need them on this mild slope with well-worn boot tracks across it. We took a short break here before splitting up, Mason and Kristine turning north across Humpreys Basin, Jim south to Lost Lakes, the rest of us (minus Ken who was still somewhere east of the pass) along the trail heading west to Muriel Lake. The trail petered out altogether before reaching Wahoo Lakes on the east side of Wahoo Peak. Tom and I had separately concluded that we might as well climb Wahoo Peak (also from a previous Challenge) on the way since it was practically free and there was very little snow on the NE Ridge we planned to use. Alberto was more or less along for the ride and had no objections to following us once we explained the plan upon reaching Wahoo Lakes. The lower part isn't much fun with large boulders, some loose, but it grows better as the route steepens and the rock becomes more solid. It took us four hours to reach Wahoo Peak, slightly longer than my first time eight years earlier. We found no register, a little disappointing, but later I learned we hadn't found one (or left one) at that first visit, either. Soon after Alberto had joined us, we turned south and enjoyed the half hour traverse along the connecting class 3 ridgeline to Paine Peak, an unofficially named summit which doesn't quite qualify for bonus peak status. It is, however, on the Glacier Divide, with our Challenge peak now only 3/4mi away to the southwest. It was necessary to drop about 300ft to a saddle between the two and we found the going easier on the southeast side of the divide rather than along the ridgeline proper. Past the saddle the going becomes somewhat tedious, lots of talus and boulders to deal with and again we favored the south side of the ridge as it continues west towards our summit. As we neared the crest of the divide we found there were multiple outcrops vying for highpoint honors and the difficulty increased from the tedious class 2 to more interesting class 3+. We had to thread our way around some of the intervening pinnacles before finding the highpoint at the westernmost of the outcrops. Now nearly noon, we'd spent the better part of six hours to reach the summit - this was a bit harder than I had expected. We found a MacLeod/Lilley register from 1984 with only a handful of parties signing in on the first few pages in the interim. The last party to visit had been more than two years ago when Eric Su and Mason had visited while traversing the entire ridgeline on a backpacking trip (which is why Mason had instead chosen to do Humphreys today). It was the smallest summit party we'd had in four days with only three of us up there. While we took our break, we considered other options for descending. The one with the most style points would have been to descend the class 4 Northeast Ridge to Paine Lake, but it looked very hard from our vantage point and we dismissed that one with a bit of a shudder. We didn't really relish going back the way we came and eventually Alberto and I settled on descending south off the summit to easier ground 1,000ft below, before traversing the base of the divide back around to Snow-tongue Pass. Tom elected to return via our ascent route, and after an hour's effort, he met up with us again below Snow-tongue Pass on the west side, neither route proving faster than the other. The west side of Snow-tongue is straightforward class 2 while the east side is a bit steeper and harder. There was much more snow there, too, but this turned out to be a blessing. With the help from the crampons and axe, it made the return to Wahoo Lakes go very quickly, saving us a heap of trouble from the underlying boulders and talus that would have taken far more time to navigate. In less than half an hour we got from the top of the pass to the lakes. Along the way we passed by Scott who was heading up to the pass on his way to the peak still. He'd been distracted with the climb of Peak 12,540ft, a bonus peak between Goethe Lake and Wahoo Lakes near the divide. It had taken him hours longer than expected and with three other bonus peaks still in the works, he would be out for almost 18hrs on the day, not returning until after midnight. Ken never made it to Glacier Divide, turning around somewhere enroute. Mason and Kristine returned from Mt. Humphreys half an hour before us. Jim eventually reached Goethe, but it took an inexplicably long time, some 14hrs all told and he wouldn't return until near sunset. Starting early, Michael, Robert and JD had gone to the Hermit today, a long outing with a class 5 summit block that would take them 16hrs to complete. I was relieved when Michael stumbled into the motel room around 10p where I'd been sleeping for more than an hour already. Since he'd started from the same trailhead and the Hermit was harder than Glacier Divide Peak, by the Challenge rules he did not lose any ground in the jersey competition and remained tied with me for both the Yellow and Green jerseys. Scott continued to pad his lead in the Polka Dot Jersey, now with 25 peaks in only 4 days. Without any real competion, the White Jersey had been sewn up by Zach in the first two days, the only days he had joined us for.